A small (0.8 acre) CRP field near the barn and wetland has been planted to prairie in a different manner. Instead of killing all existing vegetation with glyphosate, we started with a combination of burning and overplanting, using wet-mesic and wetland species. This experiment was begun in 2001 and was partially successful. However, by the fall of 2004 we realized that we were not going to get rid of smooth brome simply by waiting for prairie vegetation to outcompete it (at least not in our lifetimes). 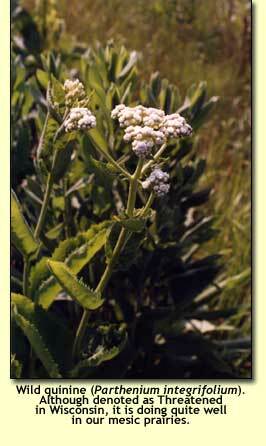 Herbicide treatment was added to the operation, but with a different approach. The first burn was carried out in April 2001. The fuel was primarily exotic smooth brome, which had moved into the field during the mid-1980s, when it was last cropped. After the burn, the field was planted with wetland and wet-mesic prairie species that had been collected elsewhere on the property. During the summer of 2001 wild parsnip was removed by hand, and Canada thistle was treated with glyphosate (spot foliar treatment with 2%). The field was also mowed in mid-summer and the crop removed (used by a local beef-cattle farmer). This whole process was repeated in 2002: burning, seeding, mowing, weed control. 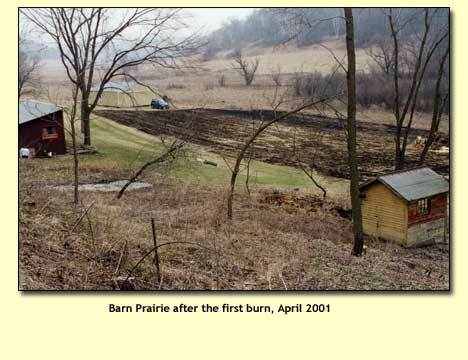 In 2003 the field was burned again, followed by overseeding. This time it was mowed early in the season (late May). Weed control by hand pulling continued. 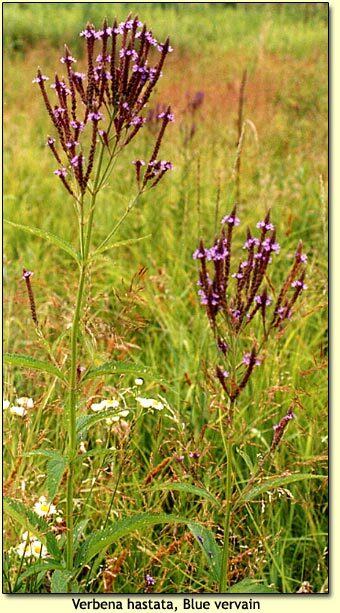 At the end of the season, a species check list showed 26 prairie species, including Indian grass, several asters, Joe-pye weed, ironweed, and all four Silphium species (none of which flowered). However, there was still a lot of exotic grasses, including smooth brome and quackgrass. In 2004 the field was burned again, followed again by overseeding, but it was not mowed at all. A check list showed 52 prairie species, all flowering and many setting seed. Special herbicide treatment Because the west end of the field had a lot of quack-grass, and smooth brome was still present throughout, we used a technique suggested to us by Jim Sime. 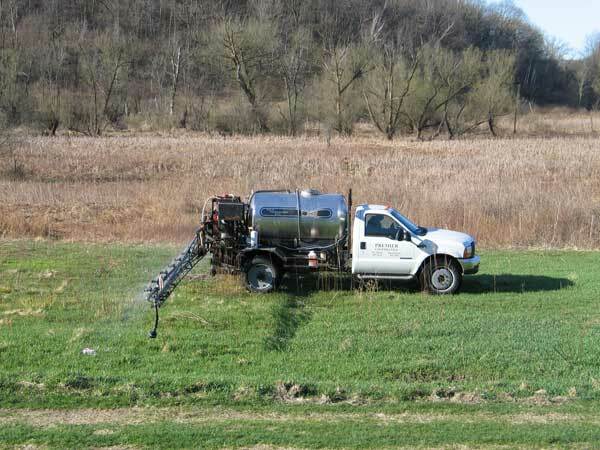 This involved spraying with glyphosate in early spring, after the exotic grasses were up but before any prairie (warm-season) plants were visible. Since glyphosate is inactivated when it comes in contact with soil, it has no effect on the prairie plants (which have not have yet appeared above the surface). To this end, we burned this prairie in early December 2004 so that we would be able to see and treat the bad grasses as soon as they appeared. In early April, the local co-op (Premier; Black Earth) came with their boom sprayer and sprayed the whole field. (Because this little field was well below the level of the co-op's minimum charge, we also had them spray some other fields on the same trip.) Using the co-op for this task made lots of sense, because their spray rig is very efficient and the job can be accomplished in very little time. Getting the timing of the spraying correct was a little tricky. 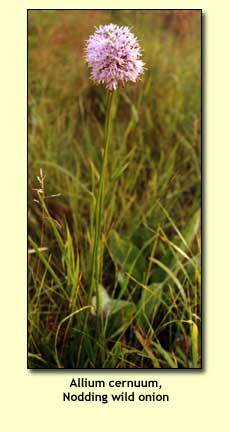 The co-op recommended that the field be sprayed at the time that the exotic grasses were about 4 inches tall. Thus, close monitoring was important, and when the grass was getting close to the right height we alerted the co-op that we would need them soon. The first week of April in 2005 was quite warm, so that small shoots of some of the prairie species were above ground and were partly affected. However, this was not a permanent effect and the 2006 observations showed that they were all present and growing well. The results for the summer of 2005 were quite satisfying. Prairie dock, ironweed, cup plant, bottle gentian, glade mallow, several Rudbeckias, prairie blazing star, wild bergamot, wild quinine, golden Alexanders, Indian grass, and many other species were present and flowering (see list below). The smooth brome and quack grass were greatly reduced in amount, and their space was occupied extensively by fox tail grass, an annual that did not persist. 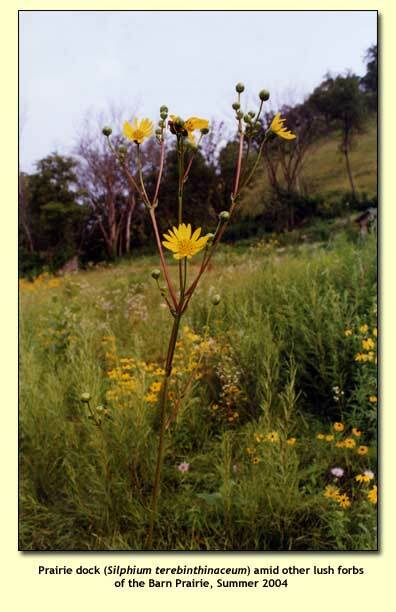 Noteworthy in 2006 was big bluestem, Indian grass, and an additional Silphium species, compass plant, all of which flowered this year for the first time.